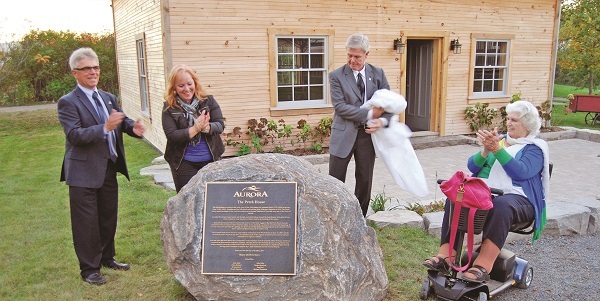 Since restoration work was completed, Aurora’s Petch House has been perched proudly, reconstructed log by log behind the Aurora Seniors’ Centre – but just sitting there for nearly a year awaiting a purpose. The next chapter in the long life of the log cabin could start to gain some clarity next week as Council examines suggestions from the public, and Town Staff, on just what should be done with the building. Considered one of the oldest buildings in what is now Aurora, the Petch Log House started life in the Township of Whitchurch in the 1840s. Since that time, over the subsequent century and a half, time, and Aurora’s boundaries, ultimately caught up with the house, and its history was folded into that of our Town. Eventually, however, the land it was sitting on was poised to be redeveloped by Smart Centres into Walmart and for nearly a decade, it sat precariously on a rack, mouldering, and open to the elements on Leslie Street, awaiting its fate. The last Council ultimately voted to restore the building log by log to its present location, but since its unveiling and rededication last year, it has sat there empty, without plumbing, wiring, or a second floor that would be up to code, until a possible use could be determined. Although a possible determination was likely to be a couple of weeks away, Councillors will have an early crack at figuring what to do with the empty building this week, prompted by questions raised at Council last week from Councillor Evelyn Buck. Councillor Buck said she was hoping to bring forward her own idea for the building last week, but was ultimately unable to get it on the Council agenda in time. Her idea, she said, was to turn the building into something akin to a wedding chapel, suitable not just for weddings, but also rustic wedding photos, all within a stone’s throw of the Seniors’ Centre hall which could be used both for washroom facilities and, following the ceremony, a suitable banqueting hall. That use, she said, would require little to no alteration to the Petch Log House as it stands today. Amenities of the Seniors’ Centre would be close enough for use, and it would take advantage of what she views as an underused professional catering kitchen. At the time, Aurora CAO Neil Garbe said staff had a list of ideas collected from the public, staff, and committees, and were working on compiling them into a report which would evaluate each option by the required work which would need to be carried out in the building to make each idea a reality. Since the bare-bones list was ready to go, he said it could be brought forward for discussion next week. On the staff side, they have put forward a number of suggestions including storage space, leased commercial use, a tourism information centre, the wedding option, a rest stop for hikers and walkers, a daycare facility, and even a home for the Aurora Sport Hall of Fame, among others.